IF GOLF is serious about wanting to attract a new young audience then it is universally agreed that the biggest single issue it has to address is the time that it takes to play 18 holes. This is not helped by the pace of play demonstrated week in, week out by tournament professionals on the PGA and European Tours. It is impossible not to admire everything that Bryson DeChambeau has achieved during the past 18 months, but something surely needs to be done about his funereal pace of play. Can you imagine DeChambeau, Jason Day and Kevin Na playing in the final group together? By the time they reached the 18th green everybody would have packed up and gone home. DeChambeau has defended the way he plays, so it was refreshing to hear three-time major champion Brooks Koepka having a go at slow players. It has to be said that Koepka likes to get on with it, and it has done him no harm whatsoever. Last year he successfully defended the US Open and defeated Tiger Woods to also claim the US PGA Championship, so when he talks, perhaps we should listen. 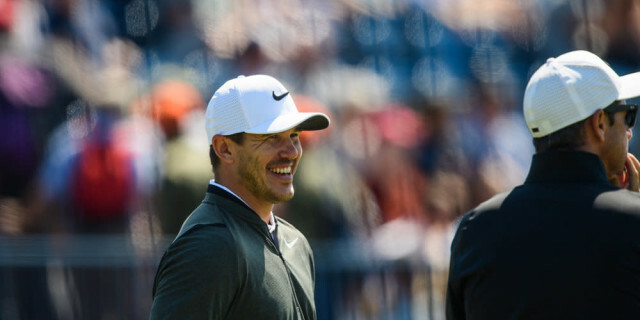 Koepka has a refreshing approach and said: “It’s not that hard” to hit a golf ball and called the speed in which some players play “embarrassing.” He is playing in the Saudi International and was asked for his views on the PGA Tour’s slowcoaches. “I just don’t understand how it takes a minute and 20 seconds, or a minute and 15 to hit a golf ball — it’s not that hard,” Koepka said. “It’s always between two clubs: there’s a miss short, there’s a miss long. It really drives me nuts especially when it’s a long hitter because you know you’ve got two other guys or at least one guy that’s hitting before you, so you can do all your calculations, you should have your numbers. Obviously if you’re the first guy you might take 10 extra seconds, but it doesn’t take that long to hit the ball, especially if it’s not blowing 30 [mph]. Unsurprisingly, DeChambeau, fresh from his victory in the Dubai Desert Classic, has a different view. This is the man with a scientific, analytical approach to golf and often takes an interminable time to play but has yet to be penalised for his slow play. The bottom line is that referees have it within their power to penalise players, so why don’t they do it? The Shot Clock Masters conclusively proved that tournament golfers can get on with it when they have to.